All over America, there are wild and wacky alternatives to traditional places to stay when we travel. B&B's and small inns are emerging from all sorts of buildings that had previous lives...in many cases, about as far from "places to stay" as you could possibly imagine. So come along with us, for a look at my top five choices for wild and wacky places to stay in America...the wackier, the better! 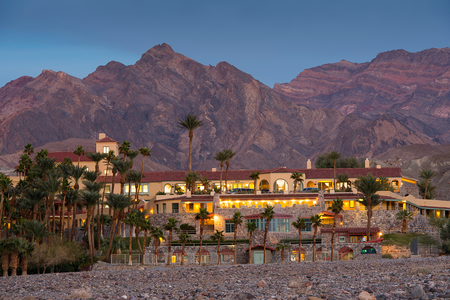 The Inn at Furnace Creek is an oasis of luxury in America's hottest, lowest place. 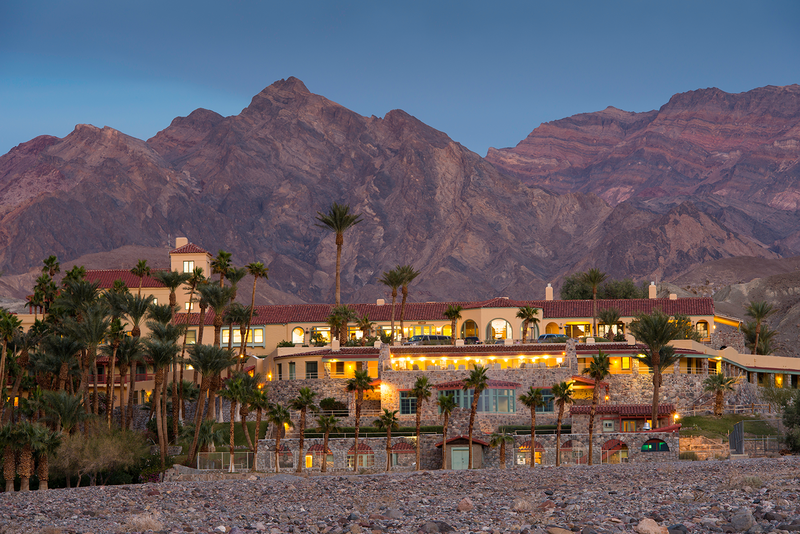 #5 - FURNACE CREEK RESORT, DEATH VALLEY, CALIFORNIA - A company called Austin Adventures specializes in taking people on trips into the wild...with accommodations into the luxurious. On its "Death Valley Adventure," the company exceeds itself. You'll spend five days in America's lowest, hottest, and perhaps most inhospitable place. But - here's where the luxury comes in - you'll be at the historic Inn at Furnace Creek, which combines this spectacular landscape with elements of "charm" and "eclectic." 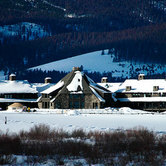 An elegant hideaway since 1927, the Inn is an AAA-rated Four-Diamond resort where "pampering" is the key word. You'll play golf at America's lowest course - 214 feet below sea level. You'll cavort in spring-fed swimming pools and on tennis courts, and maybe get a massage to ease out the kinks. And you'll ogle artifacts from the past at the Borax Museum, which is the oldest structure in Death Valley, right on the premises. 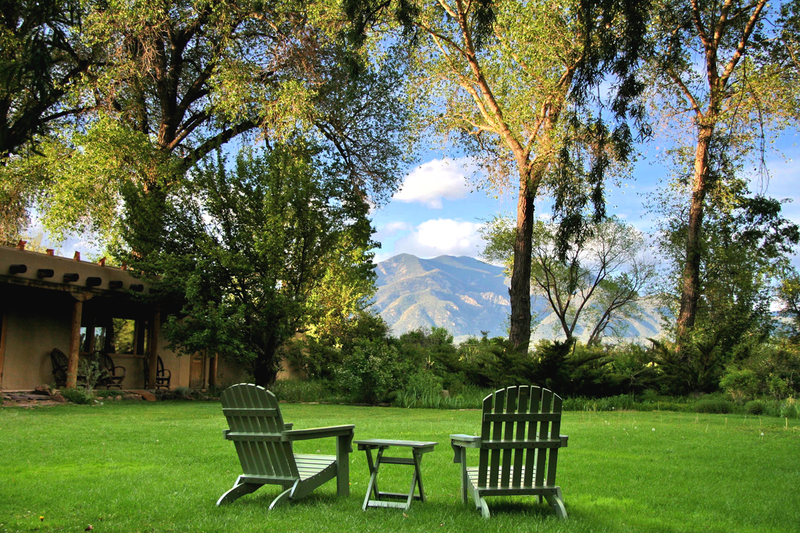 The view of Taos Mountain from Hacienda del Sol is breathtaking. #4 - HACIENDA DEL SOL, TAOS, NEW MEXICO - When you stay at this atmospheric B&B in the spiritual town of Taos, you're staying in a piece of Southwestern history. Originally built in 1804 as a Pueblo farmhouse, the Hacienda del Sol was owned in the 1920's-1940's by Mabel Dodge Luhan, the ex-New York socialite who lured many great Southwestern painters here, and was instrumental in establishing this town as a center of great Southwestern art. The current main building in the property was actually used by Mabel as a guesthouse...and among the guests were D.H. Lawrence, Georgia O'Keefe and author Frank Waters (who lived here rent-free in exchange for trimming the trees!). The furnishings and furniture are authentic Southwestern antiques, some of which were here when Mabel was. Today, Gerd (a well-known chef) and Luellen Hertel own one of the most distinctive - and award-winning - small inns in America. And when you relax on the broad inner lawn in the late-afternoon, and watch the sun turning the sacred Taos Mountain into a fiery rainbow on the adjacent Indian Pueblo, you'll know why. Staying at Fort Robinson is a trip in a time machine. 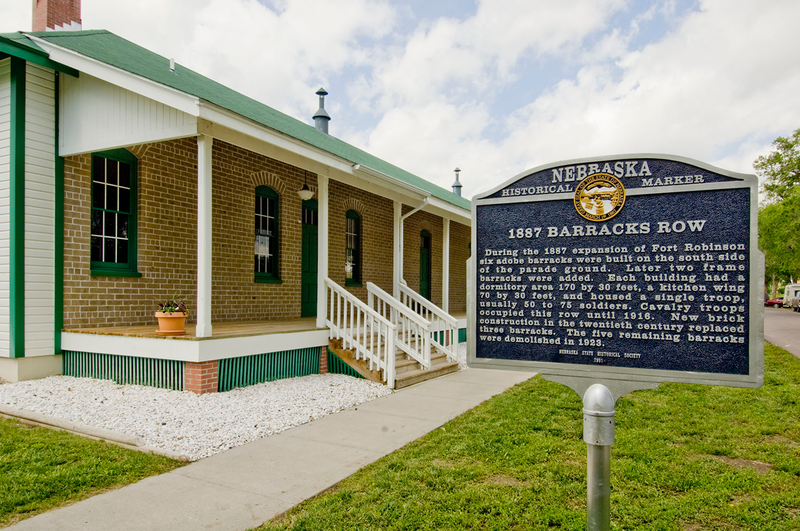 #3 - OFFICERS' BARRACKS, FORT ROBINSON STATE PARK, CRAWFORD, NEBRASKA - How many people can say they've stayed in real Officers' Quarters from the late-1800's? Fort Robinson was an active military post from 1874 to 1948. It was established to protect the Red Cloud Agency, which distributed government goods to local tribes. And the fort was the scene of several historic events, among them the Cheyenne Outbreak and the assassination of Chief Crazy Horse of the Sioux Nation. 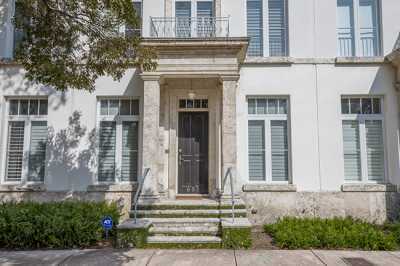 Many of the original buildings still stand, including Officers' Quarters around two sides of the 1887 Parade Ground, many of which are rented out to visitors. The park lodge in the historic Enlisted Men's Barracks includes a full-service restaurant. 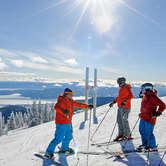 And there's a lot to do for families, including horseback riding, a breakfast cookout four mornings each week, a buffalo stew cookout four evenings each week, and steak cookouts three nights a week at the base of the scenic buttes surrounding the fort. 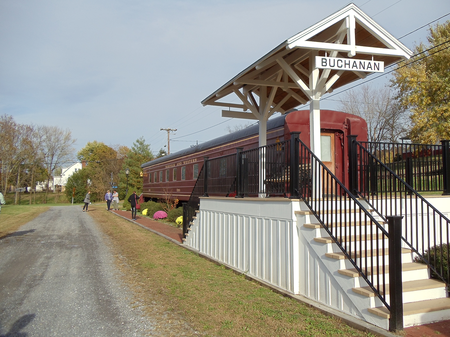 At the Buchanan Railcar Inn, you'll experience the splendor of the 1930's. #2 - BUCHANAN RAILCAR INN, BUCHANAN, VIRGINIA - In the middle of the scenic town of Buchanan, in Virginia's Blue Ridge Mountains, sits a striking old railroad car. But not just any old railroad car. This is a vintage 1934 Hiawatha Dining Car (later converted to an exclusive railcar) housing a very special "inn"...an inn in which you (and your family or significant other) are the only occupants. The car is richly appointed with fine furnishings and inlaid woods shined to a soft patina. It transports you back to an era when a journey was more than just a means to get from place to place, but an event to be savored by those fortunate enough to travel in first-class luxury. Stretching 85 feet and featuring a 45'-long living room, the car provides plenty of room to mingle or the privacy for the occupants to enjoy their own space. The furniture is reminiscent of that found in a gentleman's club car. And the experience is something you'll never forget. And now...my choice for the No. 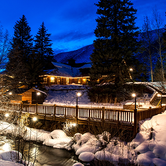 1 Funkiest Place To Stay In America! The Dog Bark Park Inn jumps out of the Idaho plains like a giant mirage. 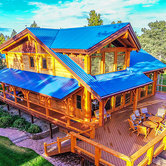 #1 - DOG BARK PARK INN, COTTONWOOD, IDAHO - This is one place that's really goin' to the dogs! Dennis Sullivan and Frances Conklin are a husband-and-wife artistic team that creates chainsaw dog carvings...and that may have created the most unusual B&B in America. Dennis has been carving wooden dogs from Idaho pine for over 30 years, and Frances joined him 20 years ago. They created a studio called Dog Bark Park. 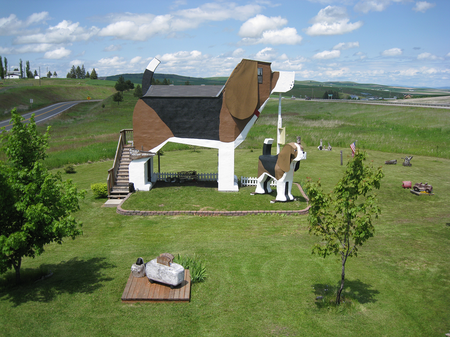 Then they decided to build a bed-and-breakfast in the shape of a beagle, which opened in 2003. (Dennis had a construction background.) When they built the beagle, they had no idea there was an architectural style called mimetic or pop architecture, nor that many travelers had expressed interest in staying in such places. They did know, however, of Americans' interest in crazy roadside architecture. 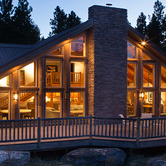 The big dog has one lodging unit, which sleeps four in the belly and two in the loft space in the head. Frances and Dennis are the sole "employees," and breakfast features Frances' home-baked granola, muffins, and breads along with local ingredients whenever possible. The big dog's season is April 1-October 31. And - for obvious reasons - you'd better book early. When you stay at the Dog Bark Park Inn, don't be surprised if you feel like doing a little howlin' at the moon yourself! 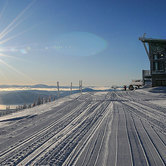 Well, these are my Top Five Funky Places To Stay In America. What are yours? Let us - and our readers - know!